On April 27th Student Data Labs ran a Vision Zero Innovation Lab as part of the Leeds Digital Festival. The aim of the Vision Zero Innovation Lab was to explore how to reduce the number of road fatalities to zero in the city. One of the main goals is to continue bringing the principles of Vision Zero to Leeds. A number of exciting long-term projects have been developed through the Vision Zero Innovation Lab. Two of the projects involve deriving key insights on pedestrian and cycling crashes across the city using open data. 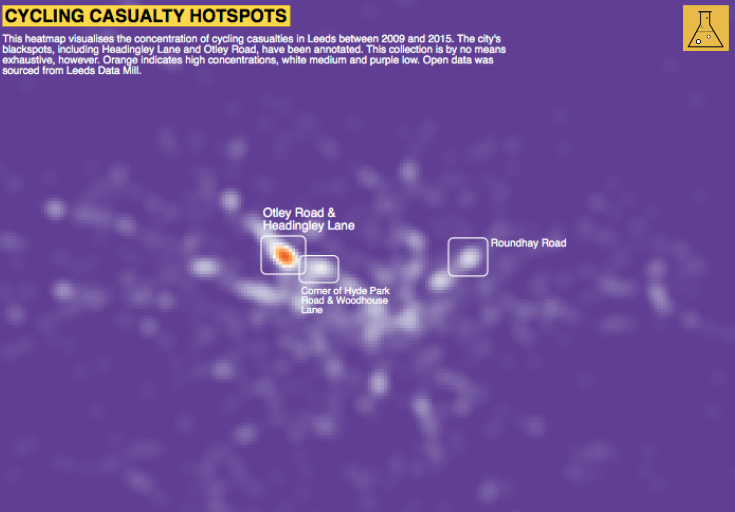 Using data sourced from Leeds City Council via the Data Mill North, you can now explore and derive insight into where cycling casualties resulting from road traffic accidents occurred in Leeds (2009-2015). The map also has a search function enabling you to drill down to specific areas or streets.